★ 5050 LED STRIP LIGHT ROLL : Glue protected LEDs waterproof IP65, 5 meters in total, 300 LEDs, 60 LEDs per meter, each LED contains 3 chips which is 3 times brighter than 3528 LED that contains only 1 chip. 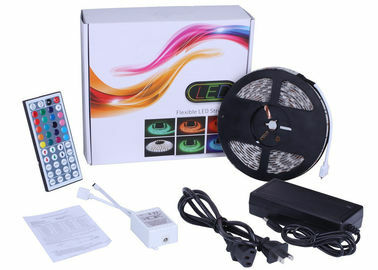 ★ FULL SET HIGH LUMEN WATERPROOF STRIP LIGHT : Come with 5 meters waterproof LED strip, remote controller, driver and connectors, all necessary accessories are included. You just need to connect them correctly and give power to the driver, the LED strip will light easily. ★ FREE APPLICATION : Every 3 LEDs can be cut and have no effect to other LEDs. Easy to install for 3M adhesive tape on the back. For its soft materials, it can be bent, folded, winding in the three-dimensional space and moving and stretching freely without break, so it is suitable for irregular and narrow space. Indoor: Decorate your Living Room, Dining Room, Bedroom, Corridor, Stairs or even Under Your Bed which is pretty wonderful! Outdoor: To light up your Wall, Garden, Trails, Trees or Swimming Pool Around Area. Public Places: Hotels, Cafes, Cinemas, Theaters, Clubs, Shopping Malls, Festivals and Performances. Architectures: Archways, Canopies and Bridge Edge Lighting, Security Lighting and Emergency Lighting.